What can India accomplish with the US-2? 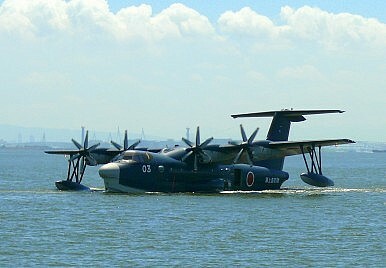 If India were to possess US-2 amphibious planes, what could it accomplish strategically? One answer is that India could project a stronger presence into the Indian Ocean and beyond without arousing suspicion in other countries. For instance, if India deploys this plane for rescuing people or for disaster management in other countries, then it will be perceived as symbolic of India’s willingness to extend tangible support to those in need and thereby mark India’s presence. These countries’ image of India will improve and New Delhi can thus expand its influence peacefully and concretely in these countries. Why does India need to show a presence now? The simple answer is Chinese assertiveness. Currently, China has been expanding military activities in the East China Sea, South China Sea, and the Indian Ocean. Viewed in light of historical experience, the changing military balance affects China’s propensity for assertiveness. For example, when France withdrew from Vietnam in the 1950s, China occupied half of the Paracel Islands. China occupied the other half of the Paracel Islands in 1974 immediately after the Vietnam War ended and the United States withdrew from the region. After the Soviet Union withdrew from Vietnam, China attacked the Spratly Islands, controlled by Vietnam, in 1988. Along similar lines, after the U.S. withdrew from the Philippines, China occupied Mischief Reef, which is claimed by both the Philippines and Vietnam. Furthermore, after the Cold War, the U.S.-China military balance has changed. For example, since 2000, the United States has acquired only 13 submarines whereas China has acquired at least 42 submarines. In February 2015, U.S. Vice Admiral Joseph Mulloy, deputy chief of naval operations for capabilities and resources, reported that China has more diesel- and nuclear-powered submarines than the United States. Therefore, countries bordering China, including India, must show more presence to fill the power vacuum created by a declining U.S. role in the region and deter China’s assertiveness to maintain peace and prosperity. The rescue plane is a useful tool for asserting such a presence. In this sense, the US-2 is not merely a military tool. It is more a strategic tool that will affect India’s relations with many other countries. What are the implications of the sale for Japan–India relations? The US-2 deal will have important effects on Japan-India relation and the view of the relationship from the current domestic political situation in Japan. The US-2 trade will be a symbolic first step to find new overseas markets for Japan. This symbolic first step is extremely important because some hesitation persists in Japan about exporting arms. The Japanese Ministry of Foreign Affairs has remained divided on the issue because there are many pacifist leaders who are averse to arms exports. The Japanese Ministry of Defense has also remained divided because some officials are afraid to be seen as leaking secrets. The Japanese Ministry of Economy, Trade, and Industry is also uncooperative because it believes that defense trade is not part of their portfolio. Public opinion also remains divided on the question because most Japanese people have been educated as pacifists. Under those circumstances, the “defense industry” in Japan also hesitates to export weapons. In Japan, most big companies related with defense have not relied on the defense component of their business. For example, Mitsubishi Heavy Industries, which is the manufacturer of tanks, warships, and fighter jets for the Japan Self Defense Forces, receive only 5.6 percent of its total revenue from the defense sector. Like Mitsubishi Heavy Industries, Japanese “defense companies” receive 90 percent of their total revenue from the private sector. Therefore, the motivation to export arms of in these companies is not particularly strong. In addition, these companies are concerned about their image. In other countries, if a company can use defense-related technologies, customers commonly infer that the products made by the company are produced at a high level of quality and technology. However, in Japan, if companies tried to export weapons, customers might see them as a “merchant of death,” so to speak. Therefore, the possibility exists that their civil sector income will decline in such cases. For that reason, some hesitation persists about exporting arms among these defense manufacturers in Japan. As described above, under such a situation, a symbolic first trade is an extremely important political step to change the mood in Japan. If India concludes the US-2 trade, then people who support the arms trade will get political power and will be active to suggest further arms trade. Especially, immediately after Japan failed to export its Soryu submarines to Australia, the effects of the conclusion of the US-2 trade will set a new mood for Japan-India defense cooperation. Therefore, a US-2 deal should not be regarded as a single transaction; it can open the door to the procurement of a wider varieties of defense-related technologies for India from Japan. If India concludes the US-2 deal with Japan, what kind of defense technologies can India expect to get in the near future as a next step? Japan has a considerable number of sophisticated technologies and know-how. For example, to protect India’s aircraft carriers, India must address China’s anti-ship ballistic missiles, which can attack India’s aircraft carriers at any time. Therefore, New Delhi needs a sea-based missile defense system. Under the joint Japan-U.S. development of sea-based missile defense systems, Tokyo is taking the lead on developing important components. Consequently, Japan and India, along with the United States, can potentially cooperate in the missile defense sector. Furthermore, because missile defense systems are closely related with space technologies, the possibility exists that Japan-U.S.-India cooperation in the missile defense sector will extend to cooperation in space as well. Moreover, minesweepers are an important tool for India to deal with Chinese submarine incursions because submarines can deploy sea mines, providing a powerful area denial capability. Japan has good know-how and equipment to dispose of sea mines. In fact, since its involvement in World War II, Japan has had to sweep sea mines for more than 65 years after the war. In 1950, Japan participated in the Korean War to sweep sea mines. Furthermore, in 1991, Japan sent mine sweepers to dispose of mines after the Gulf War. As a result, under the Japan-U.S. alliance, the United States counts on Japan’s mine-sweeping expertise. Japan is proud of its world class know-how in mine-sweeping. Finally, Japan’s submarine detection sensors are sophisticated because Tokyo has placed an emphasis on detecting Russian submarine activities since the 1980s. Japan’s systems are world-class in this regard. Therefore, to address China’s naval activities in the Indian Ocean, Japan-India strategic cooperation in this area can also be extremely effective and useful. Therefore, as described above, this US-2 sale is has critical strategic potential. Despite rescue being the main purpose of the aircraft, it can also be used as a concrete display of the India’s presence and power projection. Furthermore, asserting presence is of vital importance to maintaining peace and prosperity throughout the Indo-Pacific amid a potentially declining U.S. role. If those who support arms trade in Japan gain power by concluding this US-2 trade, then India will receive more access to Japan’s sophisticated defense-related technologies. Therefore, those in both countries that regard security cooperation between Japan and India as an important priority, must not hesitate in promoting the conclusion of this deal, thereby opening the way to strategic benefits for both countries. India-Japan Military Aircraft Deal Faces Further DelaysModi-Abe Summit High on Rhetoric, Lagging in AgreementsJapan’s Summer of DiplomacyIndia-Japan Defense Ministers Agree To Expand Strategic CooperationJapan’s New Imperial Era: What’s in a Name?